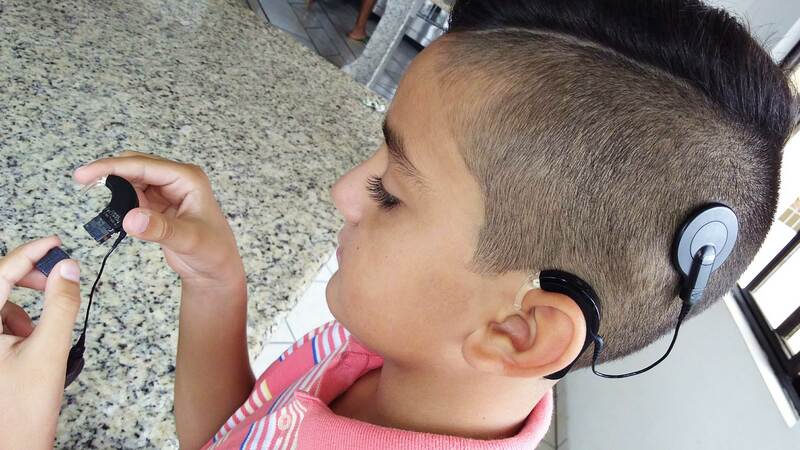 A few months ago we introduced you to Deborah, mom of 10-year-old bilateral cochlear implant user, Alexandre. Deborah and her family recently tried out the Rechargeable Battery Mixed Kit for SONNET, which includes the two standard and two micro SONNET Rechargeable Batteries. Here, Deborah shares her and Alexandre’s review of the products. We were really looking forward to testing out the Standard and Micro Rechargeable Batteries for SONNET as we had been following all the news related to their launch. Finally we received the kit, and we’re excited to share our review! My son Alexandre used both products over the course of a week. I made sure that Alexandre tested them out in all of his regular activities, including going to the beach, talking on the phone, and watching television while using the Roger Pen assistive listening device. Firstly, I read through the entire manual that came with the mixed rechargeable battery kit. I then followed the first step which is to fully charge all four batteries, the two micro and the two standard, which took about 3 hours in total. Charging the batteries is a very easy and practical process, but you need to pay attention when fitting the batteries into the charging device. Therefore, I recommend that this be done by an adult. Alexandre, who is very curious, was observing us all of the time and asking about what we were doing. We explained each step carefully because in the future he will be responsible for looking after all of this himself. Once the batteries were fully charged, it was time to connect the battery adapter to Alexandre’s SONNET audio processor, and insert the rechargeable battery. It is quite simple to do. For those who are already used to changing the disposable battery compartment, there will be no difficulty in using the rechargeable battery adapter. We decided to first test the standard batteries for a duration of more than 9 hours, as recommended in the manual. Both batteries had an average life of around 11 hours. These results really pleased us and so we decided to carry out tests on the micro batteries the following day. Again, we were surprised at the micro batteries’ life, which lasted over 7 hours. We were getting more and more excited about these two products, and Alexandre too! He commented that the batteries felt very light. He also loves the micro battery because it is very small and the audio processor practically disappears behind his ear. We tried out the SONNET Standard Rechargeable Batteries with the activity that Alexandre would most likely use them with—swimming. Finally the weekend came and we prepared to go to the beach. WaterWear for SONNET is supposed to be used with the SONNET Standard Rechargeable Batteries. The Micro Rechargeable Battery is not compatible with WaterWear, because of its smaller size. We headed out to the ocean and Alexandre swam for a long time. After going back home, the batteries were still providing power. So we decided to go swimming in the pool to wait for the batteries to fully run out so that we would know the duration of each one while using WaterWear. We found that the battery life was almost identical to the use without WaterWear. From this experience, I think that use with WaterWear is one of the best ways to use the SONNET Standard Rechargeable Batteries. Otherwise, you need to buy disposable alkaline batteries to use SONNET with WaterWear. This can be expensive and the disposable batteries can run out of charge quickly. The next morning after the beach and pool day, we tried out the SONNET Standard Rechargeable Batteries while using the Roger Pen System, a wireless microphone, in combination with the Roger X FM receiver. Alexandre used the Roger Pen to talk on the phone, watch television, and play games on the iPad. We also helped him to try it out in conference mode as he uses the Roger Pen at school every day. We were anxious to know how long the rechargeable batteries would last with the Roger Pen, because the only time reference we had was when he was using 675 Zinc Air batteries with it. Again the battery life surprised us, with both sides lasting around 7 hours 45 mins. This means the standard rechargeable batteries last long enough for Alexandre to go to school and return home without the need to change batteries. This was no doubt the best surprise and satisfaction for us. Like the vast majority of parents, we had many questions about how the rechargeable batteries work because it is a new product on the market. I found there was only a little information available about them on the website and Blog, and so I was not sure if it would be worthwhile to invest in purchasing them. After a week of testing out the standard and micro SONNET Rechargeable Batteries, all our doubts were cleared and expectations surpassed. We were surprised with the quality and the ease of use. The various functions of the product cover the majority of daily activities Alexandre gets up to in school and leisure time. We are very happy and satisfied with the SONNET Rechargeable Battery Mixed Kit. Due to their economic advantage in saving money on disposable batteries, and the diversity and ease of use that this product offers, we are going to use these batteries from now on. Thank you, Deborah and Alexandre! Get more information on the SONNET Rechargeable Batteries here! Subscribe to the MED-EL Blog by entering your email below to get the latest product reviews, guest stories and tips and tricks tips delivered straight to your inbox! *Note: Please be aware that the SONNET Rechargeable Batteries Mixed Kit is only available in certain countries. Contact your local MED-EL Representative here to find out more.